Curtis Welsh took this image of Maxton church on a cold and crisp afternoon, with bold colours and shadows evident as the sun was setting. The cost of the subsidy paid by the public for the drinking and dining places at Westminster is about £3m per year. 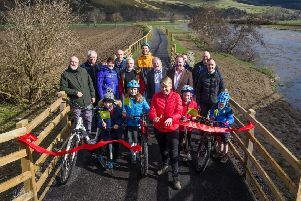 Because our parliamentary representative, John Lamont, enjoys these facilities with his colleagues and guests, while at the same time complaining that an agreement between the Scottish Borders Council and its workforce is not “value for money” (‘Council paying £90k a year to union reps’, Southern, January 17). What hypocrisy, Mr Lamont. Or is it an attempt to deny council staff workplace representation? The 33 elected union reps working for their members – Mr Lamont’s constituents – will undoubtedly save the local authority and its workers much time and money. In 2016 Scotland voted decisively to remain in the European Union. facing the stress and madness of Brexit, as our voice on this most crucial of issues has, of course, been completely ignored. The EU is Scotland’s biggest single market for international exports (worth £12.7bn in 2016). A further £3.6bn is exported to countries with which the EU has a free trade agreement. Last year over 10,000 Scottish companies were reliant on imports from the EU. The impact on these firms, their domestic suppliers and customers will be devastating. For manufacturing, retail and logistic companies who operate ‘just-in-time’ production, for exporters of iconic Scottish seafoods and other perishables, it will be a disaster. The Scottish Government has had to set aside nearly £100m so far just to deal with a situation we, as a country, stated emphatically we didn’t want. Companies like Airbus and Ford, who depend on the EU, are looking to relocate their businesses out of Britain. Between them, Airbus and Ford employ 27,000 workers, not including their extensive supply chains. The NHS is already facing severe staffing problems, as EU migration dropped dramatically after the Brexit referendum. Supermarkets are being told to stockpile food and essential supplies. More millions are being allocated to pay for refrigeration to stockpile medicines, increased prices and shortages are already being reported. The pharmaceutical industry has warned that government action may not be enough, and patients may themselves have to start stockpiling. The value of sterling has gone through the floor – the list goes on and on, and now we learn Westminster is considering introducing martial law because of the violence and massive social upheaval ministers think may happen. and reported to the Metropolitan Police, and where the latter group has been referred to the National Crime Agency. all the while waving a big Union flag. This is madness, complete madness. It will affect all of us. We voted overwhelmingly against it and yet it is happening. We can do much better than this, and surely it’s time now for us to show the determination and courage as a country to do exactly that. Having voted Conservative all my life, I will never do so again. I read MP John Lamont’s comments in the Southern, which reflected his personal opinion, but in my view they clash with the majority vote to exit the EU. He might think that being bullied by our so-called European partners is acceptable, but I for one do not. If Mr Lamont does not have the backbone to stand up to these ghastly individuals and their strong-arm tactics, I strongly suggest he stands down and makes way for someone who can. I voted to leave to EU, not to be intimidated by a bunch of cowardly bureaucrats on both sides of the English Channel. Have we learned anything from this tawdry, demeaning episode in the history of our United Kingdom? Maybe we have realised that we no longer live in a proper functioning democracy. There is agitation for a second referendum. Why should we believe they would accept the verdict when both the electorate and Westminster have trampled over the first? And there is no guarantee that a general election would change anything when it comes to Brexit. My own preference for Brexit is no deal without compromise, but with Prime Minister Theresa May clinging on to the wreckage of her doomed deal, anything can happen. The sovereign United Kingdom must ultimately be a free four-nation trading country without compromise to others. This will be far more important to Westminster soon than Brexit, due to existing calls for independence. This year marks the Chinese Year of the Pig – and one wishes all Chinese folk good celebrations. Not so the English, who celebrate their Year of the Lemming as they rush headlong over the cliff to the racially-cleansed Brextopian future of hyper-inflation, mass unemployment, civil disorder, food and medicine shortages, scores of bankruptcies, the end of the NHS and all the other “benefits” of Brexit. I, for one, will look on with considerable pleasure as a country which is already the political, cultural and social laughing stock of Europe races back to the Stone Age – by then Scotland must be well out from under. It was striking to note that, according to Downing Street, it will take more than a year to organise another EU referendum. This is, of course, an attempt to undermine the call by the People’s Vote campaign for such a plebiscite and is total and utter nonsense. It would be perfectly possible to organise a referendum to take place in much shorter order, without trampling on constitutional and practical requirements. Indeed, the first EU referendum was called in February 2016 and the vote itself took place in June 2016 – a mere four months. The referendum to establish the Scottish Parliament was held in September 1997 following the election of the Labour party in May that year – again four months. Further afield, Greece’s referendum to decide whether that nation should accept the bailout in the government-debt crisis was announced on June 27, 2015, with the referendum taking place on July 5. While a week to hold a vote, as was the case with Greece, may be a little overambitious, the idea that another EU referendum would take more than a year to organise is patent drivel. Edinburgh and Glasgow councils want a business parking levy included in the Transport (Scotland) Bill. Local authorities are eagerly awaiting the outcome since this has nothing to do with congestion and air pollution, but money for their pet projects. It is suggested that a £400-a-year charge is introduced. Let’s trial this first with public sector employees who get free parking at their work (excluding NHS staff). Charge the 129 MSPs £10 a day, the 1,223 councillors £5 a day, those on salaries over £80,000 £10 a day and the rest £3 a day. This would raise multi-millions and if, after 12 months, there are no walkouts or strikes, then – and only then – could the £400-a-year charge be fairly levied on businesses. I am a disabled rugby enthusiast and proprietor of my own private rugby museum on historical and original amateur 15-man code international, South African provincial and South African representative rugby memorabilia from yesteryear. I am a supporter of the following rugby sides: British Barbarians, Durban Collegians, Edinburgh Rugby, London Scottish, Old Hararians, Villager Rugby Clubs, Blue Bulls, British Lions, Scotland and South Africa. I am appealing to readers who can help me re certain items of British Lions, French, Scottish and Welsh rugby memorabilia for display in my museum to contact me. My contact details are: address – F. J. van der Vyver Van’s Rugby Museum, P. O. Box 5122, Pretoria, 0001, South Africa; email – vansrugbymuseum1966@gmail.com; phone – + 27 83 689-0896. A national charity is looking for nominations for a local group or individual who has gone the extra mile to improve their local community. Living Streets, the UK charity for everyday walking, is looking for inspiring stories of community cohesion for their annual Charles Maher Award – Walking Champion 2019. The award recognises an individual, local group, organisation or local authority that has made a real difference to their local streets and improved them for people. The award was set up in honour of Charles Maher, a campaigner and longstanding supporter of Living Streets. The 2018 Charles Maher Award was won posthumously by Edinburgh architect and campaigner, Alison Blamire. Alison led the Causey Development Trust, a grassroots campaign that sought to reimagine a neglected, car-dominated cityscape and turn it into a vibrant, people-friendly place that celebrated the history and spirit of the Southside of Edinburgh. We know there are fantastic people doing incredible work for their local community to make their streets safer and more attractive places to be. We think it’s only right that these amazing, tireless, inspirational folks get some love in return. The Living Streets Charles Maher Award can be entered by an individual, local group, organisation or local authority via the nomination form on the Living Streets website: www.livingstreets.org.uk/charles-maher-award. The nominations deadline is Wednesday, February 13.